I have been a busy bee lately. It is funny, when you can’t walk much it leave plenty of time for your hands! Yeah I love steampunk and gear aesthetics. The watermark gets in the way a bit, but unfortunately one cannot be too careful. I really like how the gears look like stars behind her as well. As usual I drew this by hand from scratch. The plan is to etch her in copper and glue her to the top of a pretty wooden box. 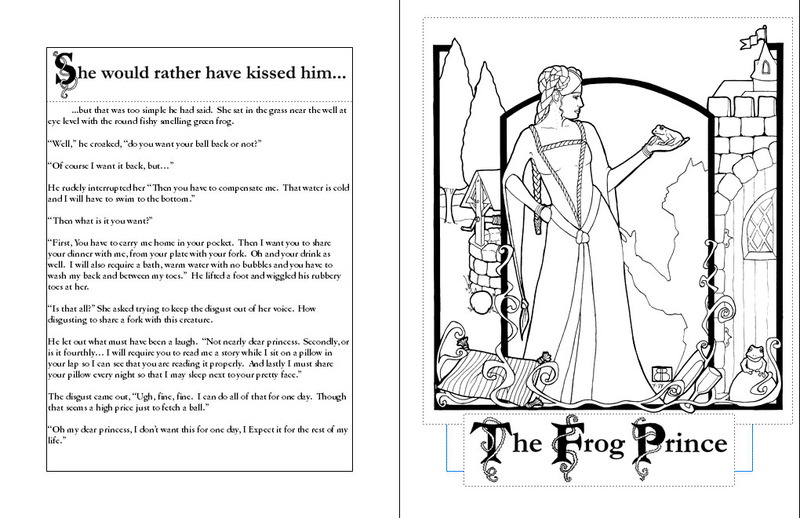 And part two of this blog… A sample glimpse of our Twelve Tales coloring book spread! It is just a screen shot of it in publisher, but it is nearly done! This entry was posted on May 6, 2014 at 7:18 PM and is filed under Art & Illustration with tags art, art nouveau, Bobbie Berendson W., Everything Steampunk, gears. You can follow any responses to this entry through the RSS 2.0 feed. You can leave a response, or trackback from your own site.